Chairman and Managing Director, SAIL Saraswati Prasad has said the persistent strategic approach to improve operational profitability assisted SAIL to improve the EBIDTA in FY’18 to Rs 5,184 Crore, a substantial increase over FY’17. He said this while addressing the shareholders of Steel Authority of India Ltd. (SAIL) on Company’s 46th Annual General Meeting held here today. He added that the improved operational performance is backed by increase in Saleable Steel production, higher share of Concast production, improved product mix, improvement in BF Productivity, reduction in Coke Rate & Specific Energy consumption, reduction in specific wage bill etc. In FY’18, after slimming losses by around 83%, Company’s Profit After Tax (PAT) on standalone basis improved to Rs (-) 482 Crore from Rs (-) 2833 Crore in FY’17. The consolidated profit after tax of the Company stood at Rs (-) 281 Crore for FY’18 as against Rs (-) 2,756 Crore in FY’17. The Managing Director said that SAIL has almost finished its balance Modernization & Expansion Program. He reiterated that FY’18 witnessed several landmark achievements through ramping up of new facilities and surpassing previous records in physical performance. SAIL achieved its highest ever production of Hot Metal of 15.983 MT, Crude Steel of 15.021 MT and Saleable Steel of 14.071 MT. It also clocked an all-time best performance of Continuous-Cast (CC) Steel production of 12.80 MT with a growth of 9% over previous best of 11.77 MT, achieved in FY’17. He added that, on the back of various new initiatives to improve productivity and efficiency across all Plants, every Unit has registered improvement. Bhilai Steel Plant’s new BF#8 ‘Mahamaya’ and SMS-III were commissioned during FY’18 and the Plant also supplied long rail panels (260 meters) to Indian Railways from new Universal Rail Mill, registering a growth of around 112% in FY’ 18. At Durgapur Steel Plant, Narrow Gauge Wheels from Wheel & Axle Plant and High Strength Structural E350 grade from Medium Structural Mill (MSM) were developed in-house. Rourkela Steel Plant’s New Plate Mill recorded a growth of 48.1% over CPLY by rolling more than 8 lakh tonnes and the Mill exported 1,27,000 tonnes of CE marked Plates to the European Market as well. With consistent efforts, Bokaro Steel Plant registered record production of Cast Slab at 3.276 MT (previous best: 2.990 MT) and highest ever production of CR Coil for sale at 0.916 MT against previous best of 0.776 MT. Sighting positive outlook for global and domestic steel industry, he further said that growth in domestic steel consumption is strongly backed by robust development of India’s infrastructure sector. It is further supported by 7.8% growth in domestic finished steel consumption during the FY’18, as a result of growing activities of steel intensive sectors. 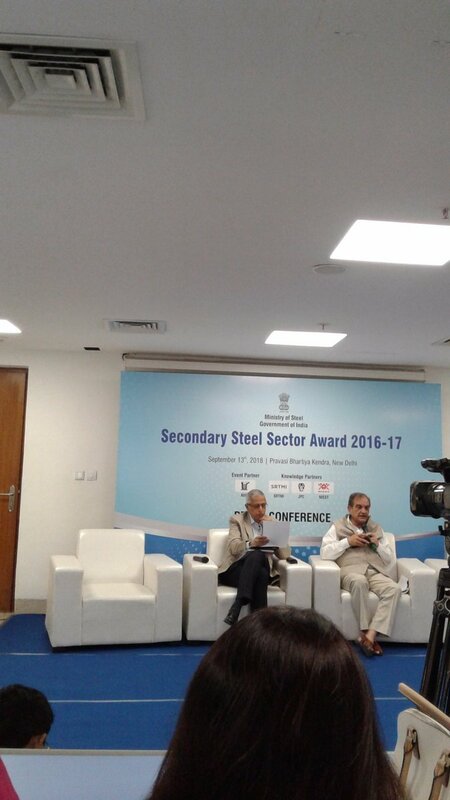 He said, SAIL continues to be the nation’s trustworthy steel supplier and SAIL steel is being used in country’s major developmental projects.